After blogging for years I wanted to find a way to connect with my audience more, something more personal, more fun and easier to consume. 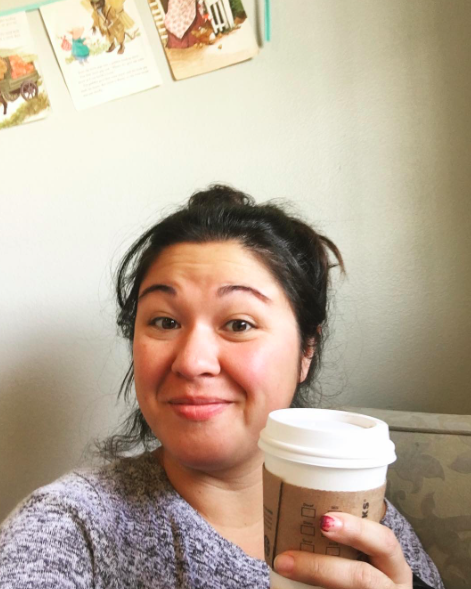 Several of the biz babes I admire were really getting into live webinars and I knew that it was something I wanted to try, especially since I was working on a digital product and wanted a way to get it in front of people. So I decided to jump in and do my first live webinar. Side note: Simply deciding to do it was a big step for me. I was one of those people who basically wanted to drop out of college just because of the required speech class. I’m not a public speaker, but I knew this would be one of the biggest steps I could take to change my business. 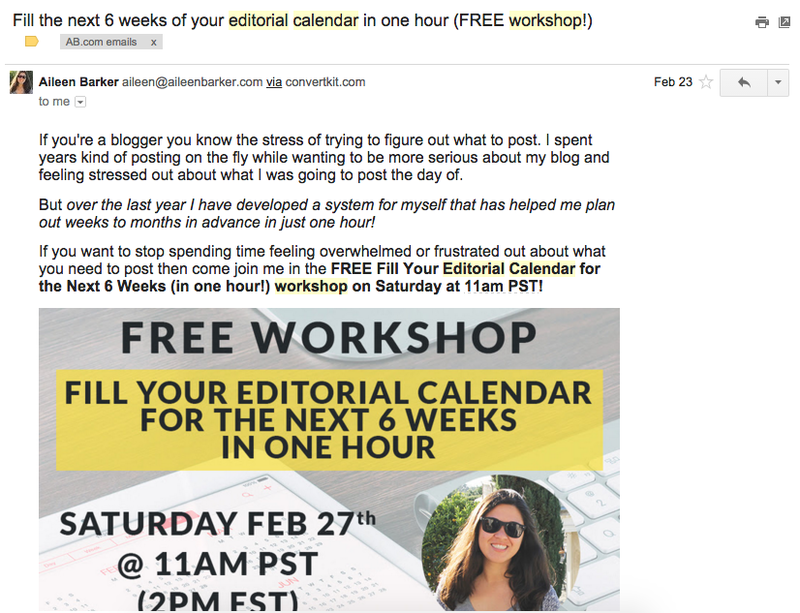 I decided to call it a workshop instead of a webinar because I wanted people to really work on their editorial calendars during the workshop, rather than just watch me teach. Plus, workshop sounds more interactive while webinar is a word that people associate with being sold stuff. While I was selling something, I was also teach a class with real steps and a finished product. 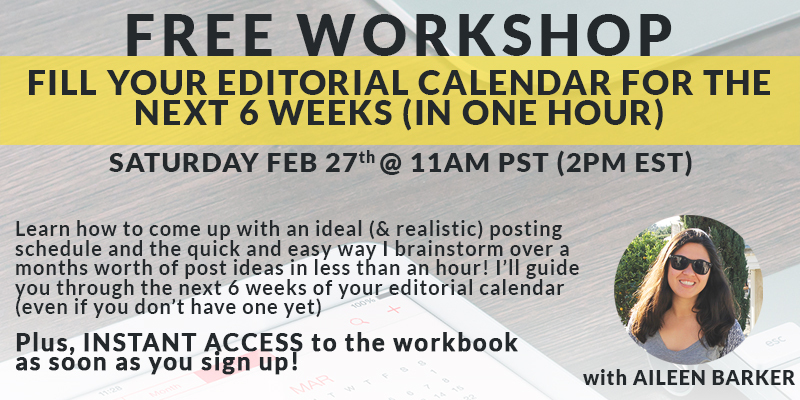 I decided to call it a workshop instead of a webinar because I wanted people to really work on their editorial calendars during the workshop, rather than just watch me teach. The last thing I planned before I got started was my goal. It was hard for me to write down a goal because I didn’t want to fail. But I forced myself to do it and decided I wanted 40 people to sign up and to enroll 5 students in Minimalist Blogging. You can’t achieve goals you don’t make! While I wasn’t sure what to expect, I did want something to strive for. When I sat down at my computer to start working on the workshop I wasn’t sure how to get all of this information out of my brain to teach other people. So the first thing I did was create an outline of what I wanted to cover in a Google Doc (see image above). Then I just started creating slides one at a time. The first few were the hardest because I wasn’t sure how to start. I referred to the folder I have on my computer with screenshot of slides from webinars I’ve attended to spark ideas and see what other people cover as a guideline. 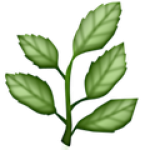 Once I got going, I was able to create slides pretty quickly using my outline. I did a lot of deleting and rearranging slides so everything would flow nicely. In the end, I had 77 slides which was just about perfect for a 45 minute long workshop with a 15 minute Q&A session at the end. Because I was teaching a workshop I wanted to make sure my attendees had a workbook so they could work along with me and fill out their editorial calendar. I created a three page workbook using Apple Pages. I created it simultaneously while I wrote the slides just kind of jumping back and forth as I worked through all the sections I wanted to cover. Even though I’m a designer, it wasn’t anything fancy. I kept it black and white for simplicity and since a lot of people only print in black and white and don’t want to use a ton of ink. Or is that just me? I went back and forth about whether I should have a script. In the end, I decided to just use the slides to guide me with a notepad with to remind me of anything not on the slides. Instead of having a script, I allowed my presentation to flow naturally with what I had on the slides. And I made sure to run through the entire thing (all the slides), out loud, a couple times before I went live to make sure I had an idea of what I wanted to say. Instead of having a script, I allowed my presentation to flow naturally with what I had on the slides. When it came to marketing I did all of it through my email list and my social media. 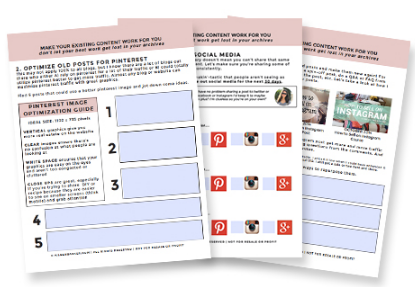 I created a couple of marketing graphics for twitter and instagram and just posted them regularly leading up to the workshop. I only posted on Instagram twice (I should have posted more!) and I posted about it on twitter anywhere between 2-5 times a day. But the biggest thing was my email list. I sent out an email to my list four days before and the day before, so two emails total to invite my entire list. I made sure the emails were almost like a sales page, identifying a problem (feeling stressed or overwhelmed about blogging or not knowing what to post about) and then giving them a solution (having an editorial calendar filled out for the next 6 weeks). Most of my sign ups came from these two emails to my email list. I made sure the emails were almost like a sales page, identifying a problem and then giving them a solution (your webinar). Even though I’m pretty good with all things tech, I wanted to make sure that I knew what I was doing before the live workshop. I set up my leadpages page (where the workshop was being hosted) and asked my sister facetime with me while I figured out how to set up and navigate Google Hangouts so I could see what was happening on her end. This is a must. Don’t try to figure it out the day of! We sat on the phone for about 40 minutes (longer than I expected) while I figured out how to do everything and got myself comfortable with google hangouts, my new web cam and mic, etc. I’m so happy that I didn’t try to figure this out half an hour before the workshop because I would have been so stressed out! The morning of the workshop I made sure I had everything set up around my computer and ready to go. I had my notes, went over my slides one more time and just made sure I had everything in place. I had an email set to go out to the attendees two hours and then 15 minutes before the workshop to make sure they remembered to attend and had the link to get in. I also included the download link to the workbook so they could follow along and physically work on their editorial calendar while I went through the lesson. 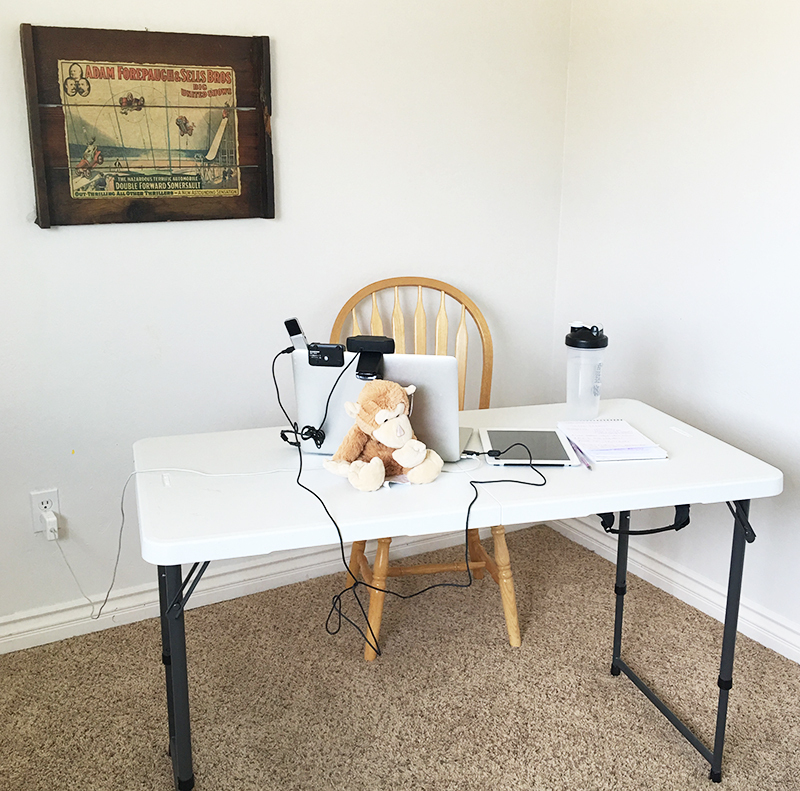 My webinar set up in my sons playroom where I knew I wouldn’t be disturbed and the light was good. When I finally sat down for the workshop I had my laptop and I also had my ipad next to me so I could keep an eye on the chat if anyone had questions. The first few minutes were a little scary, but I felt like I got into a groove and felt confident with what I was saying since I ran through it several times outloud the days leading up to the workshop. But then I had people in the chat saying they couldn’t see or hear me. I kept chugging along, stopping once in a while to make sure people could see me, but I could see that people were leaving and that was really, really nervewracking. I had no idea why so many people were leaving, but I kept going. I did cut out a few times and, WARNING: when Google Hangouts disconnects and then reconnects it sometimes connects to the camera, even if you were screensharing. This is the only way I knew that I had disconnected. In the end almost no one was left, no one asked any questions in the Q&A and I was feeling super down about it. I left questioning what I did wrong and if my content was good or not, but eventually knocked that thought out of my head so happy that I had finally done my first live video webinar and loved it. After the workshop was over, I realized what had happened. I rewatched the video and saw just how many times I had cut out and the video and audio disappeared. Of course people were leaving, they couldn’t see or hear me! I went into iMovie and cut out all the parts where I was cut out. Out of about 56 minutes of video, I was left with just about 40 minutes after cutting out the parts where I lost my connection. So frustrating! I uploaded that replay to youtube and added it to the webinar page then sent out an email with the replay link explaining what happened and apologizing to anyone who attended live and had to leave. Also, since I did pitch my Minimalist Blogging course at the end, I made sure to email a couple of times reminding my attendees that they could purchase it at the discounted launch price with the extra bonuses. After the workshop I sent out three emails: a replay link then two reminders that the Minimalist Blogging course presale price and the replay were expiring. Overall I’m happy with the workshop itself. The content was really actionable and useful for bloggers and I felt completely prepared. My goal was to have 40 people sign up and I did! My marketing worked! The reality is that there were a lot of tech problems during the workshop and I know that cost me sales. Those numbers up there make me a little self conscious. Here’s the thing: we are all forever learning. I know a ton about blogging and online business, but this whole webinar and course world is new to me. An expert in any field knows that there is always more to learn and I’m sharing what I’ve learned with you. Why didn’t I sell more? During the workshop and the replay period 5 people actually signed up to start the enrollment process, but only one actually enrolled and paid to get into the course. The numbers look low, but they are higher than the numbers during my email launch which proved to me that video and live webinars convert better than emails. I’m 100% confident in Minimalist Blogging and that if I can get it in front of the right people they will invest in it and find it (blog) life changing. After going through my email launch, which I won’t get into detail about in this post, I think that the quality of my list is one of the main problems I’ve had. Some of the content upgrades I have to get people on my email list are too broad so I have a lot of people on my list that aren’t bloggers or entrepreneurs. It’s something I’m looking into and experimenting with. Even though I didn’t meet my sales goal, I learned more during this webinar that I did in all of my hours and hours research on webinars. Everything I learned will help me level up and do better next time. And not only will everything I learned during my first webinar help me in the future, it’s going to help you! 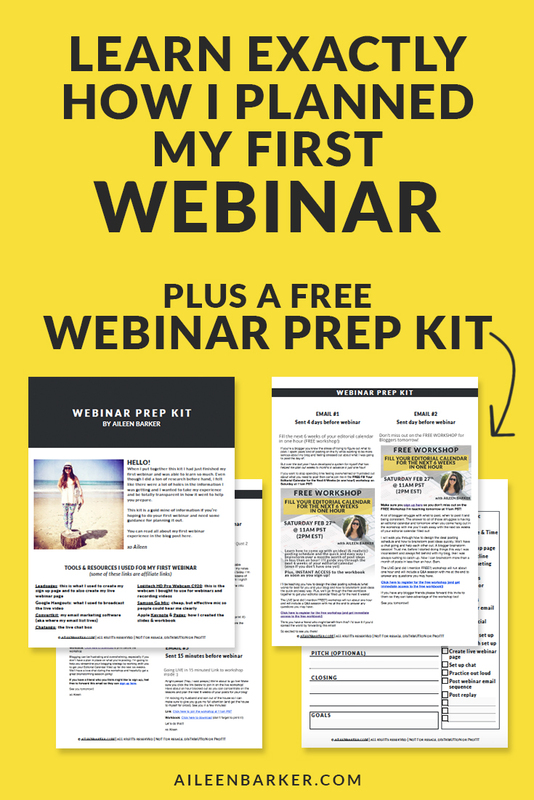 If you’ve made it this far and haven’t already downloaded it, make sure you click below to get the Webinar Prep Kit! 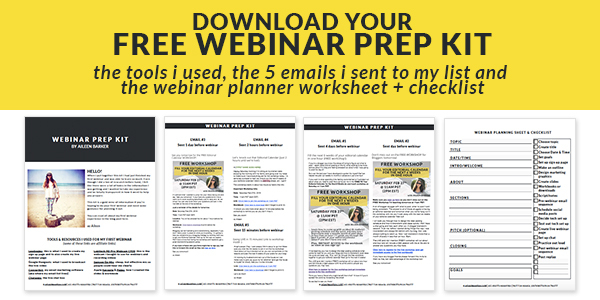 In the kit I included links to all the tools I used, the five exact emails I sent to my list and a worksheet with a checklist and fill in the blanks to help you plan your own webinar. Enjoy + get preppin’! This is a really detailed and helpful post. Thanks alot for sharing! I actually super appreciate this and love how honest you were. I imagine if I ever did one EXACTLY the same things would happen. Like you said even though you know the tech stuff just happens. I try to always be patient with people doing webinars and realize that we are all at the mercy of the internet and that can be good or bad. Good luck and keep it up, sounds like it was a great topic. Is the replay up somewhere now, you said it was on youtube I’d like to hear some of what did make it in. Thank you so much for this honest and informative post, Aileen! I’m planning on hosting my first webinar in two weeks, and appreciate your willingness to share your numbers and real experiences. I think sometimes we forget that everyone has to start somewhere when we see bigger bloggers reporting huge launch numbers, but I personally think these are really great numbers for your first live webinar! Good luck and I hope you’ll host more soon – I’d love to join in! Thanks Raven! I hope your webinar went well! This was a great series of micro lessons to make your NEXT webinar an even bigger success! I’m going with Zoom.us for my webinar, and I’m going to take your advice about the workbook and follow on training course! btw how much did your course sell for and how long was it?